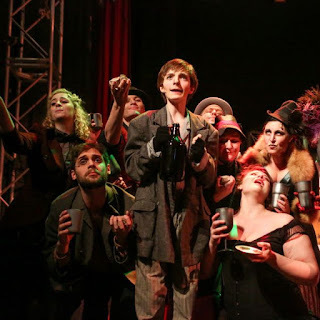 Seattle Musical Theatre tackled Stephen Sondheim’s horror musical this month. In this production of “Sweeney Todd,” a secondary character has become the audience’s guide to the dark streets of London and the darker secrets of the Demon Barber. In managing artistic director Chris Mayse's production, the vagabond Toby becomes a way to explore the effect that violence has on us all. Mayre answered some questions about this all-new production via email. Jones: This production is a big contrast to your last show, "Working." However, it's dealing with similar themes. "Sweeney Todd" revolves around class struggle. How does it feel to be doing these two back-to-back? Mayse: Class structure is certainly present in "Sweeney Todd.” This was a time when the Industrial Revolution was having an impact on those who were craftsmen by trade. This is why you saw once thriving neighborhoods, like where Fleet Street is located (the place where Todd and Lovett's shops are located), in such disarray. It surely pressed people into desperate measures. One of themes in both shows, as well as the overriding theme for our season in each of our shows, is identity. With "Working," it was about how your career defines who you are, how you are viewed in the world. With "Sweeney," we explore the idea of becoming another identity; whether it is purposeful, by circumstances, and/or by the forces of life that work on us. It's a great contrast, style-wise, to do these one after the other. Going from more of a presentational, more sociological-driven event to a Stephen Sondheim classic, mirrored off of a childhood ghost story that’s in the style of Grand Gugol opera. It's awesome to be able to offer such varied approaches to musical theatre this season! Jones: Sweeney Todd can be a very complex musical to stage. When working out the designs for your production, what elements were the most exciting or the most exasperating to stage? Mayse: All the designs aspects have been so inventive and outside the norm of what we are traditionally use to. Now, that's not to say that all the classic qualities of blood, throat-slitting, and meat pies are not there. It wouldn't be “Sweeney” without that! However, our designers took the challenges I presented them and really ran with them. They gave me a plethora of technical aspects to explore and use throughout the process. The set, for example, is not the traditional two-level, bake house/pie shop that you may know from the original Broadway production. I think we've come up with something new and inventive when it comes to moving the action of the story scenically. That was a challenge for me to sort through as the process went on. But, as the cast and I got more comfortable and confident with things, I think the scenic elements are brilliant! Jones: While Sweeney and his meat-pie cook Mrs. Lovett occupy center stage, one of the joys of this musical are all characters who interact with them. Do you have a favorite? Mayse: I have a soft spot for this show; as it was one of the first musicals I encountered when I got into professional theatre 24 years ago. I even had the opportunity to play Todd once, what a challenge that was! All of the characters are so rich and complex. The brilliance of Sondheim is he can take a simple concept such as a painting or a setting (like the world of fairy tales in "Into The Woods"), and create layers of character and action via his brilliance with music. It is a deceptively challenging story, as you can't have one or two dimensions to the characters. They must be fully formed and the artists involved must allow the roles to resonate fully within them. When that happens, it is truly magical. Jones: What drew you to Toby as a point-of-view character? Mayse: He is the least defined of all the principles, in regards to his background and how he is positioned to enter into the story when he does. We cast two young men to take it on, as I wanted the POV that we are assigning to Toby for this version to have that much more impact on how it is perceived by the audience. He is the one of the few principles to survive the story; the only true innocent involved, until he too goes over the edge by the end. Giving the story to him allows his journey, and ours as witnesses to this tale, to come full-circle by the end. Jones: Without any spoilers, how do you expect Toby's state of mind at the end of the play to impact the audience? Mayse: A young person, existing in a violent world, takes on the same identity of those whom he warns against in the story. Youths are so desensitized to violence these days. The end of the play really plays into the result of what such desensitization can have on a young person. The audience, too, should look to themselves with this sense of desensitization. I was always struck when I played Todd how people would laugh and/or cheer as death was committed onstage. What does that say about us as a species? These are the questions I hope the patrons ask themselves as they enjoy the bloody fun! 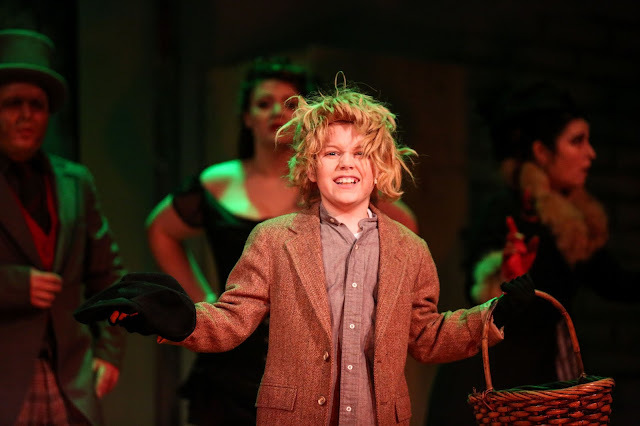 “Sweeney Todd” continues through Nov. 20 at Seattle Musical Theatre, 7400 Sand Point Way NE #101N. Check the company’s website for tickets and more information. Their next production is “Little Women” in February. Photos by Jeff Carpenter courtesy of Seattle Musical Theatre.